ECHO & THE BUNNYMEN Crocodiles (Super rare original 1980 UK vintage promotional poster for the band's debut album, measuring 29" x 20". This full colour poster depicts one of the fantastically brooding photographs of the group taken byBrian Griffin with the band name in dramatic yellow lettering at the top & 'The Album - Crocodiles' in basic font along the bottom, an amazing, near impossible, find 38 years on. The photographer, Griffin took a series of pictures of the Bunnymen in the woods near Rickmansworth, Hertfordshire at night, in order to reflect the imagery of darkness & sorrowfulness in their music. 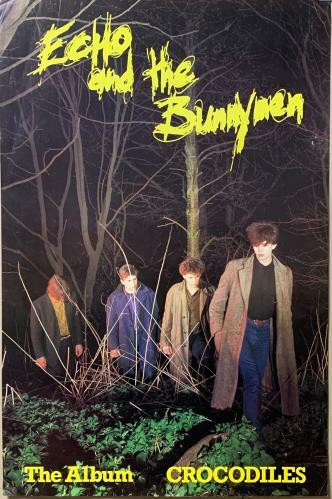 On discussion of the album's artwork & the photo session in general, critics at the time said "the Bunnymen are placed in poses of histrionic despair in a near-neurotically gothic woodland that evokes memories of elfin glades and fabled Arthurian legends" [music journalist Chris Salewicz] & "The cover art suggests four boys dazed & confused in a drugged dream, a surreal where-are-we landscape. The Bunnymen's images are of loneliness, disconnection, a world gone awry" [Creem magazine]. Apparently, the band originally wanted burning stakes in the picture, however, given the possible KKK connotations, they settled for moody lighting instead! This 38 year old poster remains in wonderful condition, with no writing or heavy tears. There are some small corner creases & light faded pinch marks around the edges, & it remains ideal for conservation framing. If you'll excuse the pun, this could be the ultimate picture on YOUR wall!). or visit our Echo & The Bunnymen image gallery.